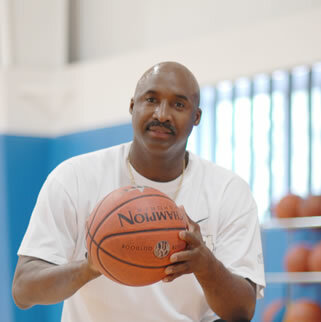 Kelvin's Basketball Academy is a basketball skills and training program run by Kelvin Lewis. Fundamentals are a crucial aspect of the game of basketball and players should be taught the correct fundamentals early in their development. KBA classes will teach youth athletes of all levels proper footwork, how to handle the ball, basic offensive moves, shot mechanics, passing and defensive skills. Kelvin's goal is to tailor his classes to help players not only learn the basic concepts of the game but to also help them improve their individual game, while most importantly making it fun. Basketball fundamental training is the foundation for developing the rest of your game! Kelvin Lewis has been working with kids of all ages for over 25 years. His goal is to help build confidence, self-esteem and leadership. At “KBA” we are a family, therefore your kids become our kids. We keep them safe as they learn, grow and have fun while playing the game of basketball. Players will be asked to select the specific dates you would like to attend. So if you know in advance that you will have to miss a class, you can elect to not select those specific dates and select your makeups (if you want) on other days of the week. You will only be charged for the classes you select. If you select less than 10 total classes, you will be charged the single class rate ($25/class). If you register for 10 or more total classes, you will be charged the discounted full season rate ($19.50/class = $195 for 10 classes). If you register for 20 or more classes, you will still receive the multi-class discounted rate ($14.75/class = $295 for 20 classes). SIBLING DISCOUNT: CJB offers discounts for families with more than one child. This discount applies to any successive child from the same family that also enrolls in Kelvin's Basketball Academy in the same season. Each sibling will receive $2 off per class. The first child enrolled is not eligible for this discount. Make-up Policy: Players MUST notify the club at info@centraljerseybasketball.com 24 hours in advance to receive a make-up. Make-ups may be used in the current season (space permitting) ONLY and players MUST let CJB know in advance what day and time they are using this make-up, no walk-ins allowed. If you are unable to use your make-up during the current season, a credit towards next season will be placed on your account. There is a maximum of 2 make-up credits per season. CJB offers rolling admissions so you can register your child at any time during the session (space permitting). Click register next to the classes below. If the class has already started already, the price will automatically be pro-rated. Make-up Policy: Players must call out 24 hours in advance to receive a make-up. Players who have make-ups may use them in the current season (space permitting) ONLY. Players MUST let CJB know in advance when they are going to use their make-up, no walk-ins for make-ups.